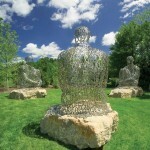 Warm weather makes outdoor sculpture viewing a delight. Albert Paley, Envious Composure, 2013, at 67th Street and Park Avenue, New York. When it comes to culture, summer is a time for guilty pleasures: page-turning beach reads, whimsical group art shows, Shakespeare done outside so you can wander off when the thee-ing and thou-ing loses its charm. Just as theaters often close up from June through August, most of the fine art world takes some time off in the summer months, with galleries scaling back or slowing the pace of their exhibitions. This can leave those craving a dose of visual art feeling a bit forlorn—even, dare we say, pining for the cool air and packed cultural calendars of autumn. But there’s one art form that thrives in the warmer months—outdoor sculpture. Whether you’re looking for a new piece for your own home or you just want to take in some art in beautiful surroundings, summer is a prime time to step outside the gallery walls and explore this vastly diverse medium. This summer, Storm King is presenting two very different exhibitions. The first is Zhang Huan: Evoking Tradition, a series of Buddhist-inspired steel and copper pieces by the Chinese sculptor. Huan’s work will be on view until November 9. The second exhibition is a single, temporary work by Brooklyn-based artist Virginia Overton. 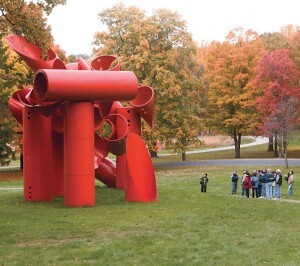 This piece is part of Storm King’s Outlooks program, which invites emerging and mid-career artists to create a work of art in reaction to Storm King’s rural landscape. Overton’s piece will be on view until November 30. Just across the river from Manhattan is the Isamu Noguchi Museum in Long Island City, Queens. The influential Japanese-American sculptor, who died in 1988, designed his eponymous museum to display a broad selection of his life’s work, and it contains an outdoor sculpture garden as well as indoor galleries. This summer, guests can see an exhibit devoted to Noguchi’s prolific design work, Isamu Noguchi, Patent Holder: Designing the World of Tomorrow. The show closes September 21. Grounds for Sculpture in Trenton, N.J., is presenting a massive Seward Johnson retrospective, featuring more than 250 works by the American sculptor (Johnson is also the park’s founder). Grounds for Sculpture’s permanent collection features work by both emerging and established contemporary sculptors, and it grows by about 15 pieces each year. Something to note if you’re planning a trip: the park’s website has a catalogue of works that you can browse by artist and individual piece, so you can easily compile a list of your personal must-see works. Perhaps the highlight of this year’s outdoor sculpture shows is taking place in Grand Rapids, Mich., at the Frederik Meijer Gardens and Sculpture Park, where renowned British sculptor David Nash will show works that he created in 2012, when he was selected as London’s Kew Gardens’ first artist-in-residence. Frederik Meijer will be the show’s only U.S. venue. Nash is most widely known for his sculptures in wood, although he works in bronze as well. “David’s work has been something that we’ve been eager to collect for a long time,” says Frederik Meijer’s chief curator and vice president, Joseph Becherer. 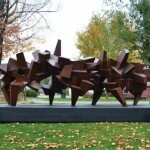 “In some ways, what David does is at the very heart of what a sculpture garden does — combining horticulture and art. David has made a life journey out of the use of trees, making art in harmony with the natural world.” In addition to the works created at Kew, David Nash: From Kew Gardens to Meijer Gardens will include a Frederik Meijer-commissioned planting of young larch trees in a new Japanese garden that will be open in 2015 (the trees, however, are already visible from the pathways). The main body of Nash’s works, which will span the park’s two conservatories and galleries, will be on view until August 17, while the three outdoor works will remain for several years. The park’s permanent collection is impressive, too—Frederik Meijer takes a global approach to collecting, and has pieces by Indian, Chinese, and Japanese sculptors in addition to American and European. The collection begins in the late 19th century with works by Rodin and Edgar Degas, and the park continues to collect contemporary works each year. For those who would rather combine their sculpture viewing with a museum trip, the Hirshhorn Museum in Washington, D.C., and the Nasher Sculpture Center in Dallas both offer strong collections. The Hirshhorn, which is the modern art arm of the Smithsonian Institution, houses a relatively small sculpture garden with pieces by Rodin, David Smith, Jeff Koons, and others. But one of the garden’s most popular pieces isn’t sculpture at all—it’s an installation by Yoko Ono, Wish Tree for Washington, D.C. The Nasher Sculpture Center is adjacent to the Dallas Museum of Art, and holds a collection of modern and contemporary work by masters like Pablo Picasso, Frank Stella, and George Segal. Through July 13, the center is showing a body of work by Bettina Pouttschi called Drive Thru Museum, which takes an indoor gallery and turns it into an urban streetscape. The Nasher is also hosting the first museum show of sculpture by Los Angeles-based artist Mark Grotjahn, who is known more for his paintings than his three-dimensional work. Grotjahn’s show will close August 17. If wandering through all these collections makes you start wishing for one of your own, there are several fine dealers who can help you begin. 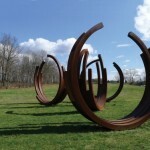 One of those is the West Branch Gallery in Stowe, Vt., which specializes in outdoor sculpture. Owned by sculptor Chris Curtis, West Branch has three acres of outdoor space for stone and metal works, in addition to the 3,000 square feet of gallery space devoted to paintings and smaller sculpture pieces. 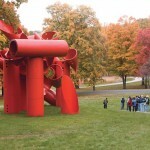 “Over the past few years, [outdoor sculpture] has really outstripped paintings in terms of total revenue. In 2013 our sculpture sales were 64 percent of our revenue—that’s unusual for a gallery, I think,” Curtis says. 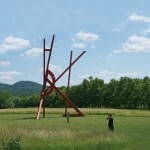 Those who are looking for a larger selection of sculptures should visit the Kouros sculpture Center in Ridgefield, Conn. Owner Angelos Camillos has roughly 100 works on view, both figurative and abstract, by modern and contemporary sculptors like Bill Barrett and Dimitri Hadzi. Camillos has had a sculpture park for 40 years, beginning simply by displaying his personal collection, and he opened the current Kouros Sculpture Center in 1981. “We have about 60 different artists showing in our field here,” says Camillos. “We work with European, Latin American, and American artists, mostly mid-career.” The Kouros also hosts concerts and outdoor events during the summer—you can request their catalog of exhibitions and events by calling the gallery. 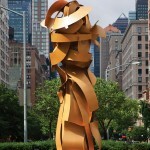 In addition to Broadway, New York’s Park Avenue is home to a series of public art pieces by master metal sculptor Albert Paley. Paley, who is one of the world’s greatest metalsmiths, last year installed 13 new sculptures along the avenue, spanning 52nd to 67th Streets. True to Paley form, the works are massive and eye-catching, many in bright colors like red, yellow, and blue. (You can learn more about the work and the installation process by watching the PBS documentary Paley on Park Avenue: New York.) And if you’re looking for more Paley this summer, you don’t have to look too far—several works by the sculptor will be on view at Chesterwood, the historic home of sculptor Daniel Chester French, in Stockbridge, Mass., from June 14 through October 13. In addition, the Corcoran Gallery of Art in Washington, D.C., is hosting a 50-year retrospective of Paley’s work, American Metal: The Art of Albert Paley from June 28 through September 28. The show will begin with Paley’s early work as a jeweler, progressing through his large-scale sculptures and his decorative, domestic designs for tables, lamps, and other furniture. With its wide focus and huge inventory, American Metal should help satisfy even the most art-starved tourists and vacationers this season.